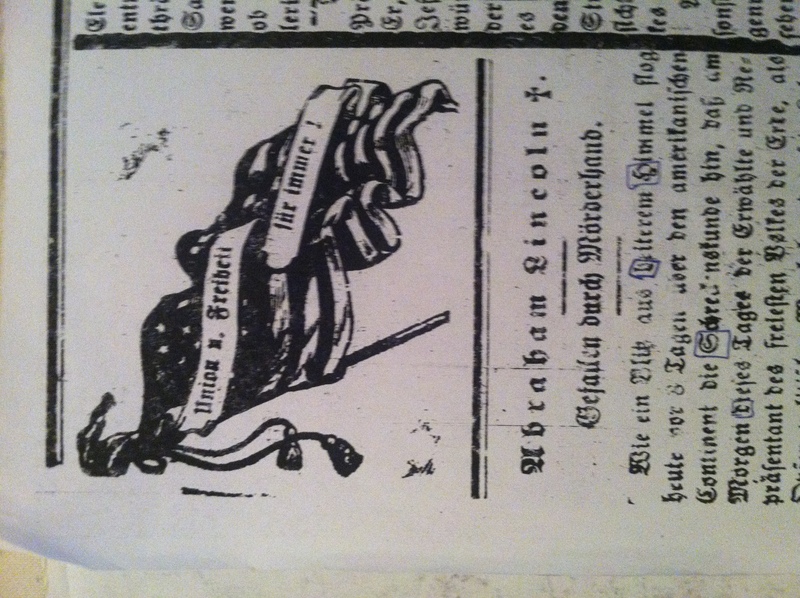 This weekly Milwaukee German newspaper’s article recounts the events surrounding Lincoln’s Assassination and reflects on Lincoln’s legacy. The article strongly praises Lincoln saying he was a martyr for his country, equality, and freedom. Written in the folds of the flag above the headline is written Union and freedom forever which is showing of how Germans viewed the war. The article also expresses that people believe that President Johnson will get revenge for Lincoln’s assassination when it says that Johnson would hang Jeff Davis. The article continually comes back to praising Lincoln for his actions as leader of the country saying he was a true servant and leader of the people and portrays Lincoln in a very positive manner. The article is still being fully translated. The article is on microfilm at the Milwaukee Public Library and may be reproduced and used for any purpose, including research, teaching, private study, publication, broadcast or commercial use, with proper citation and attribution.